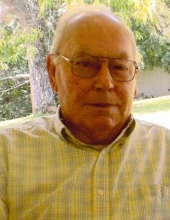 Mr. Gary Clinton Byrd, age 82 of North Wilkesboro, passed away Tuesday, April 9, 2019 at his home. Funeral services will be held 11:00 AM Friday, April 12, 2019 at Little Mtn. Baptist Church with Pastor Brian Mathis officiating. Burial will be in the church cemetery. The family will receive friends from 6:00 until 8:00 Thursday evening at Reins Sturdivant Funeral Home. Mr. Byrd was born April 6, 1937 in Wilkes County to Lytle S. Byrd and Thelma Myers Byrd. He was retired from Abitibi. Mr. Byrd was a member of Little Mtn. Baptist Church where he served as a Deacon for 53 years. He was preceded in death by his parents, a sister; Mary Stanley and two brothers; Charles Byrd and Dean Byrd. Mr. Byrd is survived by his wife; Lois Ann Mathis Byrd, three daughters; Karen Bowers and husband Buster of North Wilkesboro, Kimberly Williams and husband Perry of North Wilkesboro, Gail Wallace of North Wilkesboro, a son; Rodney Byrd and wife Heather of North Wilkesboro, nine grandchildren; Britney LaCashio, Travis Bowers, Katelan Riddle, Todd Bowers, Colby Williams, Ashton Byrd, Garrad Williams, Madison Byrd and Cameron Byrd, six great grandchildren; Gracie LaCashio, Karley Bowers, Jacob LaCashio, Andrew Bowers, Lydia Bowers and Elizabeth LaCashio and a brother; David Byrd and wife Tonya of North Wilkesboro. Flowers will be accepted or memorials may be made to Little Mtn. Baptist Church Fellowship Building Fund 388 Evergreen Lane, North Wilkesboro, NC 28659. To send flowers or a remembrance gift to the family of Gary Clinton Byrd, please visit our Tribute Store. "Email Address" would like to share the life celebration of Gary Clinton Byrd. Click on the "link" to go to share a favorite memory or leave a condolence message for the family.